The words healthy and fried do not always go together, but delicious and fried usually do. These healthier-than-meat 10 Veggie Egg Rolls nail fried and delicious! Use any combo of veggies you like that combine to make six cups of filling. Mix together cabbage, carrots, jicama and greens with 1-1/2 teaspoons of kosher salt in a colander nested in a large bowl. Allow mixture to sit for 30 minutes. Squeeze veggies to release any excess water. In a large skillet or wok, heat oil over medium heat and add onions and garlic. Stir-fry until just translucent, then add the cabbage mixture and the soy sauce. Cook, stirring constantly for three minutes, then add the snow peas and mushrooms. Continue cooking until the veggies are just cooked, about 5 minutes total. They should still be a bit crisp. Add the mung bean thread, bamboo shoots, scallions and the preserved vegetable if using. Season with salt and freshly ground black pepper to taste. Cool completely. Place wrapper on a plate so one of the four corners is directly in front of you. Place 1/2 cup of the filling on the wrapper so it’s like a cylinder that starts 2’” from the corner and ends halfway across the wrapper. Lightly brush the egg white around an 1” edge of the wrapper. 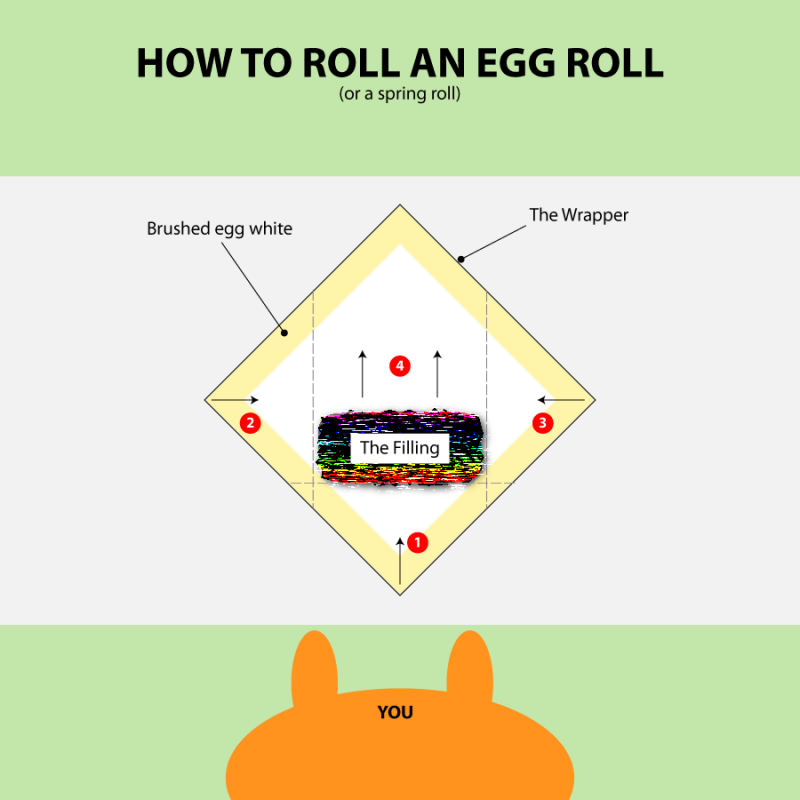 Starting with the bottom edge closest to you, roll the wrapper over the filling and tuck it around the filling so the tip is under the filling and you still have your cylindrical shape (see diagram). Pinch the edge of the wrapper on both sides of the filling, then brush the top of that edge with a little more egg white. Bring the left corner over like your creating an envelope, then do the right. Lightly brush the top edges of the wrapper and roll the egg roll closed. Set on a dry plate, seam side down. For deep frying, have ready a fry basket or a kitchen spider/skimmer or tongs for fishing fried foods out of the hot fryer and a platter lined with paper towels for draining excess oil from your fried foods. A thermometer comes in handy for controlling the temperature of the oil. Heat oil in a deep fryer, according to unit’s instructions or pour 3 inches of oil in a saucepan or wok over medium-hot heat until the oil temperature is 325 °. Carefully lower the egg rolls into the pan and fry until just golden. 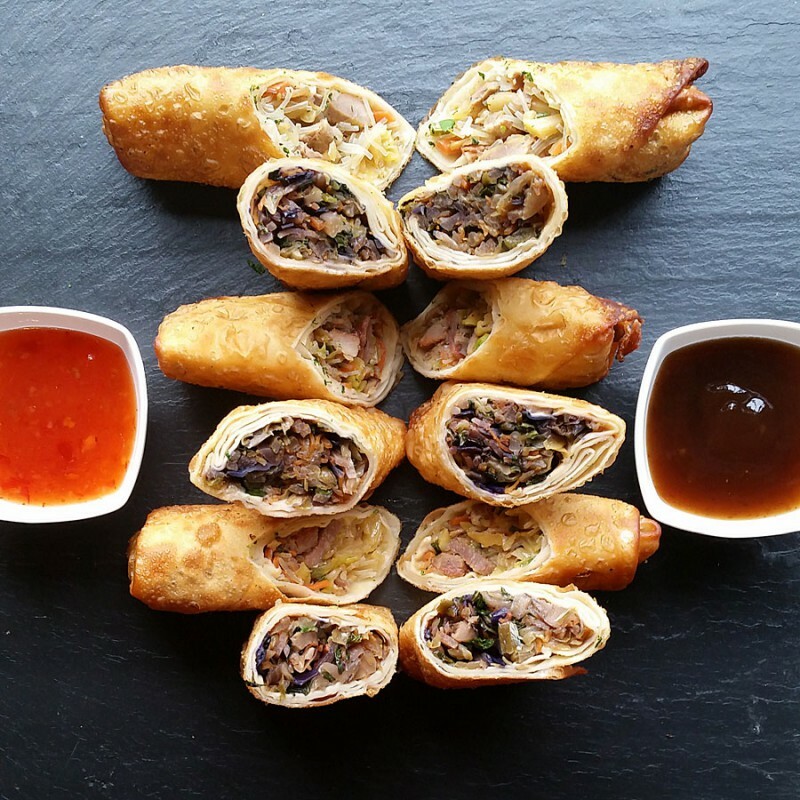 Do not overcrowd the pan.The egg roll will continue to cook even after you remove it from the deep fryer, so be careful not to overcook them. Maintain an oil temperature between 250 and 325 degrees before you add each subsequent batch of egg rolls. Cool slightly and serve. You can brown all the egg rolls ahead of time and reheat them on a rack over a sheet pan in a 400 ° oven for 15 minutes. Serve with sweet chili sauce, duck sauce and Chinese mustard. I know there are more than ten vegetables in these egg rolls, but that’s the beauty of them. You can put whatever variety of vegetables you have on hand or love in these. You can use as little or as much variety as you like. Just make sure you wind up with the six cups of cooked filling needed to make 12 egg rolls. I measured 1/2 cup of filling per egg roll so you can use that formula to make more of less of them.